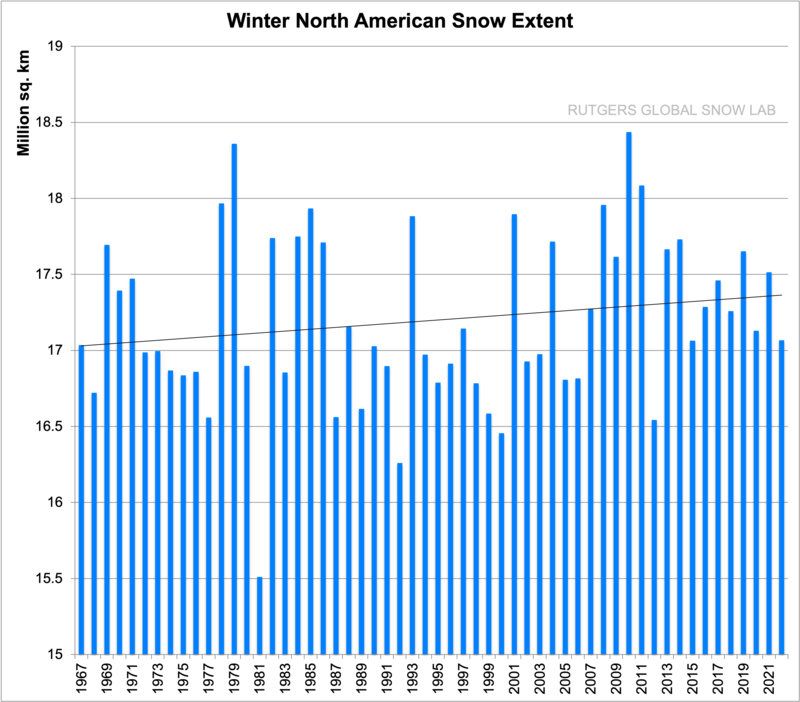 There is no [statistically significant] snow cover trend due to global warming since 1972 in the Northern Hemisphere | Watts Up With That? From the “alarmists and their cats are grumpy over this” department. 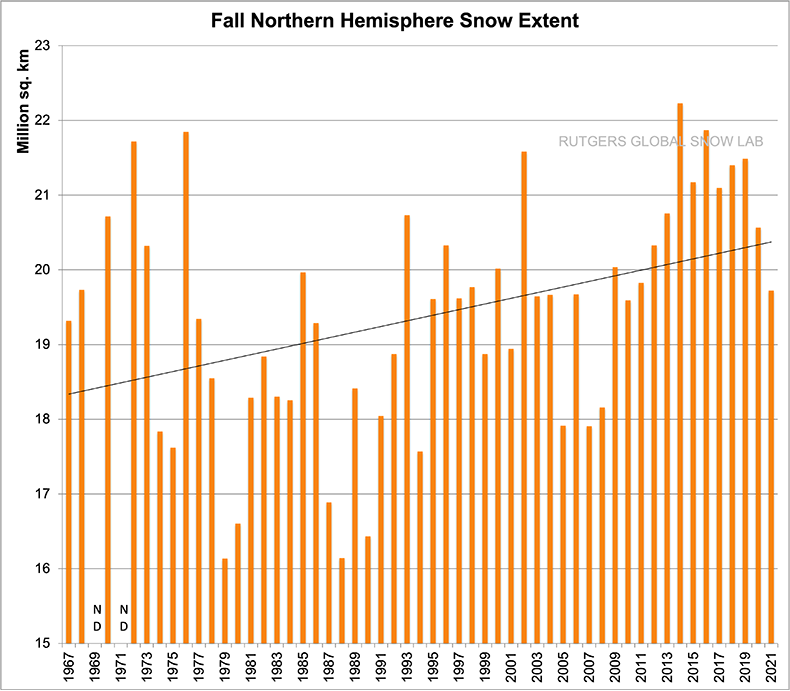 There’s been some recent hubbub over decreasing snowfall in the northern hemisphere by the usual suspects, who claim that AGW is reducing snow cover. 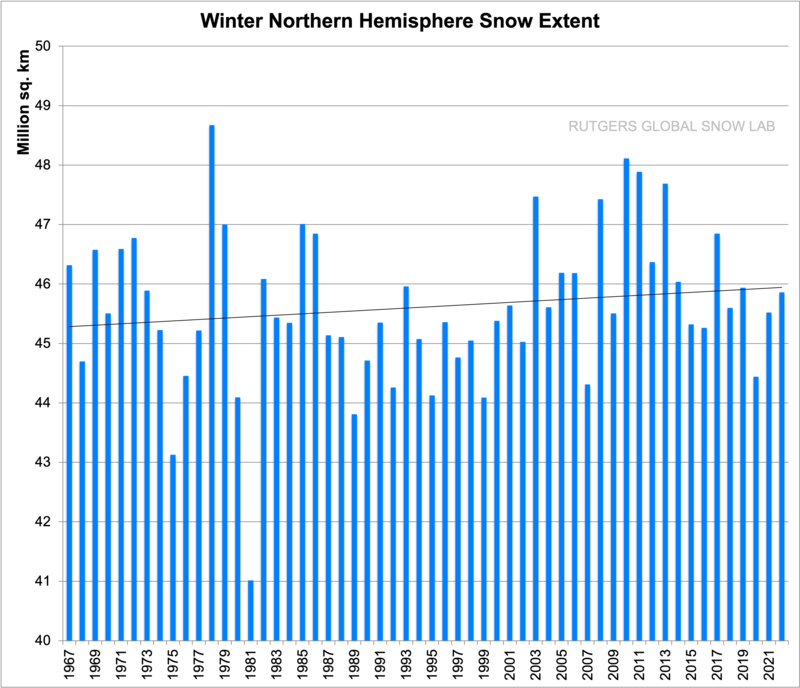 That’s opinion, then there’s data, such as this data from the highly respected Rutgers Snow Lab, as plotted by climate scientists Ole Humlum. Don’t believe it? Plot it yourself: use this link to download the original data. Hmmm … I took you up on your invitation to plot it myself. Actually, there is a trend … in fact, there are two trends. As you can see, there’s a slight negative trend overall, about a tenth of a million square km. per decade. However, an examination of the blue Gaussian average in the bottom panel shows a faster drop to 1990, then a slow rise to the present. So I took a closer look at the post 1990 data. As you can see, since 1990 the snow area has been increasing at about a quarter million square km per decade. Year -0.014501 0.008009 -1.81 0.07690 . – A small p-value (typically ≤ 0.05) indicates strong evidence against the null hypothesis, so you reject the null hypothesis. – A large p-value (> 0.05) indicates weak evidence against the null hypothesis, so you fail to reject the null hypothesis. – p-values very close to the cutoff (0.05) are considered to be marginal (could go either way). Always report the p-value so your readers can draw their own conclusions. So at 0.08 no statistically significant trend. I’ve added to the title to reflect that. [UPDATE] I thought I might add one more plot. Here are the trends of the Rutgers snow data by quarter. As you can see, there is no significant trend in the winter data. Snow in the fall has increased, snow in the spring and summer have decreased. January 11, 2019 in Snow. 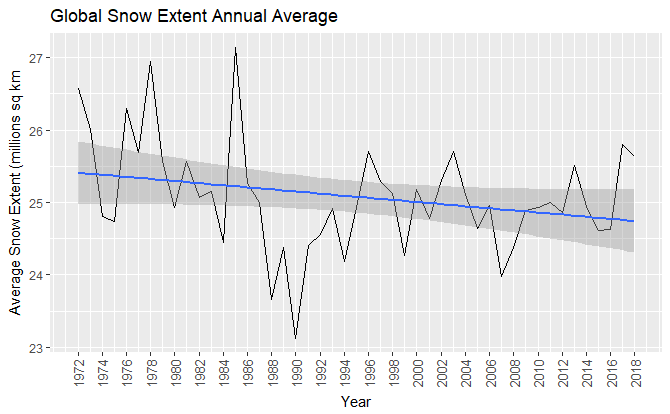 Title: There is *NO* snow cover trend…? True, but the decline in Spring and Summer are misleading since they EXPANDED significantly in the late 1960’s to late 1970’s, then from that time a decline back towards a lower level, thus making it appear it is unusual when it is not. The significant Increase in Fall and slight increase in Winter snowfall is a worrying trend since it is making a mockery of the IPCC report projecting a DECLINE in snowfall and increase in rain/freezing rain over the last 18 years. Actually there are quasi-cycles in the NH snow cover winter data. A non-stationary prominent periodicity of 7-8 years occurs until about the year 2000. Then it is quiet from 2000 to present and the periodicity shifts to a weaker 2 year periodicity. The absence/shift of the periodicity also corresponds to the PAUSE in global temperatures. First link is wavelet analysis and second link is periodgram. 1998 instead of the year 2000 is probably a more accurate date for the NH snow cover periodicity change. That would also correspond to the 1998 El Niño event. Coincidence or climate change? Can’t you ‘feel’ the reduction in snow? I live in Calizuela. I have noticed no change in snow here. Yeah, I don’t see a climate crisis either. Everything looks nice and calm. Nothing to get excited about. Acosta was funny. I bet he had no idea his clever idea of inspecting a portion of the border fence and then declaring everything looked nice and calm in the area would backfire on him. As one commenter said, “Yeah, Jim, it’s calm, because there is a fence there! I can see an intense State of the Union address coming January 29, if the Democrats don’t come to the table and make a deal on the budget and the border. I wonder if the Democrats will try to pull some stunt during the speech, because you know Trump is going to be beating them over the head about how the Democrats have failed to provide for the national security of the Untied States. We shouldn’t be surprised at anything since the Democrats have thrown their morals and civility out the window over their hate of Donald Trump, and over their hate of the fact that Trump is taking their socialist agenda apart and replacing it with conservatism that works, and that he will probably be reelected in 2020 if the Democrats can’t manage to damage him sufficiently before then, and will continue undoing the socialist agenda. There you have it in a nutshell. That’s why the Democrats are acting the way they are acting. It’s pure partisan politics. US national security and anything else takes second place to politics where the Democrats are concerned. They are not fit to lead the defense of this nation, as they have proven over and over again in the past, and now we get one more demonstration of where their loyalties lie. Their political party and political power comes above all other considerations. And what does the southern border and “deals” on funding the wall or not funding the wall have to do with snow trend data? WUWT is not The Daily Caller or Fox & (very few) Friends. This is a science website dedicated to discussion of climate analysis. Duane–global warming and climate change are political agendas. (socialist) They are not science. The creation of this blog was due to the politics of global warming. As you know global warming is based on political alarmism, not climate science. I fear you are correct that “anything else takes second place to politics where the Democrats are concerned”. However, the same is probably true for many Republicans. I am working very hard, and I hope you are too, to address each of these issues separately, instead of leaping onto one of those bandwagons and accepting all their crap together with the good. that democrat’s kids won’t see snow this winter again because from unemployment benefits you can’t finance long skiing holy days. I moved from Kali to Reno a year and a half ago. I have mentioned before on this site that the locals have been trying to convince me that our snowfalls now are much less than they were in the ’40s and ’50s when they were kids. Back then it was not unusual to get 12 feet of snow – and once 15 feet in one snowfall. In Reno and on down to Carson City. But the Reno Gazette Journal lists the record for one snowfall at 22.5 inches in 1916. The record fall for an entire month was January of that same year – 6.5 feet. All very short of 12 feet. The folks telling me these stories are about a decade older than me – and yes, lived through those storms – got out of school because of them. They had professional careers in technical fields. But they all know that AGW has reduced the snowfall here in Reno. Published facts be damned. And my wife pleads with me not to mention the actual records. They remember the deep snow because as kids they were short!🤣 The ‘big’ houses that I remember living in as a kid, today look tiny. I suspect they remember snow drifts. As a young teenager I made money shoveling snow. I quickly learned that 6” of snowfall could translate into drifts 3 to 4 feet high in some driveways. 15 feet in one storm? Maybe the Donner Party in 1846! There is where I live. Next to none so far. We might catch up in March and April. However, in the early 80’s, there was much, much more snow and cold. I think Florida stole our weather and we have theirs. Hmm! Is there a discrepancy here? 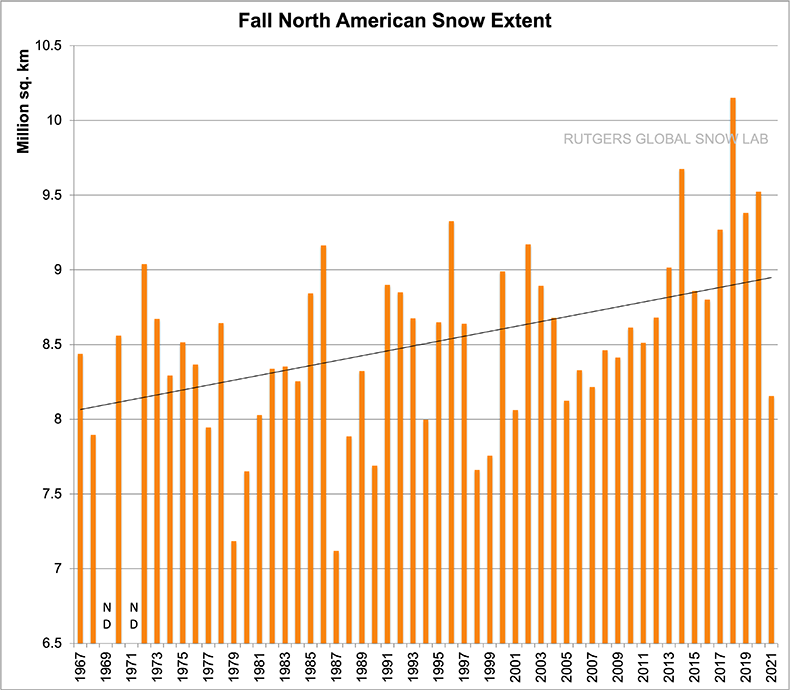 Based on Rutgers lab NH Fall snow extent has increased, winter less so and spring steep decrease. The Greenland graphs are interesting. 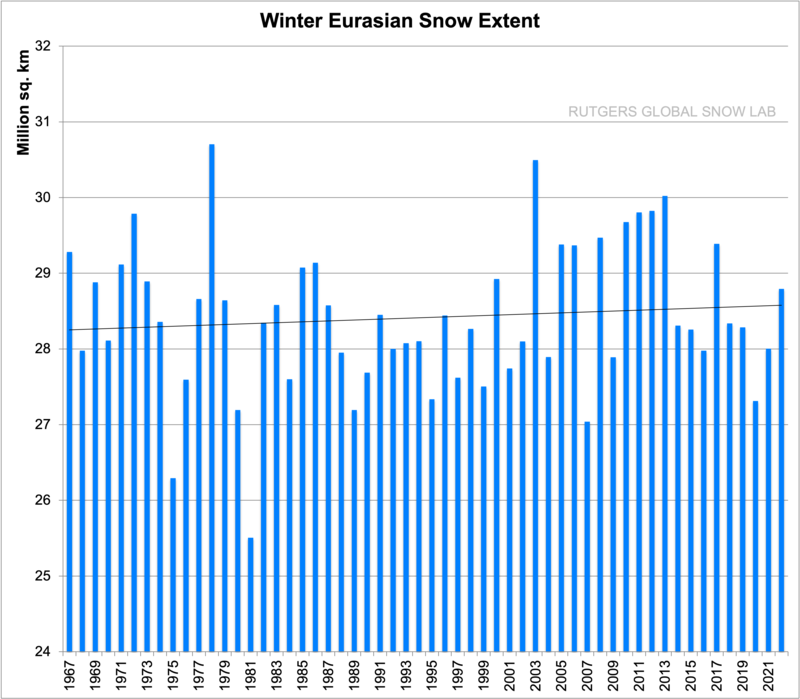 “There’s been some recent hubbub over decreasing snowfall in the northern hemisphere by the usual suspects, who claim that AGW is reducing snow cover”. It would have been nice to have some evidence following this claim about other people’s claim. To my knowledge, when alarmists have been claiming this about what snow cover has actually been doing, they referred to spring/summer snow cover, not about the overall, yearly, snow cover. You don’t prove them wrong with data showing overall yearly snow cover. Actually, you DO prove them right, because if both November and Winter NH snow cover have been recently on the rise AND the yearly snow cover shows no trend, then the Spring/Summer snow cover have to be decreasing to compensate the autumn/winter increase. “Summer snow cover ” what the heck is that ?????? Sorry, but no snow our local beaches. !! NH covers an area slightly bigger than your beaches. Even Greenland is covered, go figure. You,re correct. Winter snow cover on the rise and spring/summer snow cover decreasing. Nylo, when the subject is “AGW reduced snow cover” then, ….. unless otherwise denoted, …… said subject specifically addresses the yearly residual snow cover or snow pack at the end of the Summer “melt”, ……. regardless of the total area that received snowfall during the winter season. Samuel, I tend to disagree about what snow cover refers to unless otherwise denoted. But if it was like you said, then it would indeed be reducing, based on current data. That prediction has and is being proven wrong any time snow falls. JeHill, Samuel, nobody is discussing here if stupid and wrong predictions have been made or not. They have been made, and they are very wrong. We are talking of whether they have claimed that this is ALREADY happening or not. IN spring and summer, yes. IN autumn and winter, no. Overall, no. That’s what the data says and I haven’t seen any alarmist disputing the data. They do make dumb predictions regardless of data, yes, but they are predictions, not wrong accounting of what has happened. Nylo, we were NOT discussing “predictions” of snowfall, either past, present or future. So where have you been when there have been multiple declarations that the ski industries in the US and Europe would be damaged by lack of snow? I don’t see talks about any recent trends in those links. I see nobody claiming that there is a trend for less snow. I see, of course, claims that this will happen in the near future, or past claims that this should have happened by now. But not that it is happening. Perhaps you could quote the exact words that you think claim such a thing. I see no hard-core alarmist scientists telling that snow IS NOT a thing of the past. That is, warm winter, no snow is a usable tool of alarm in the mass media, and the elite will keep their mouth shut on that IPCC does not predict end of snow. Everybody understands that the alarm that contains boiling oceans is kind of wasted if you tell that snow will need to be shovelled in future as well. It is not 1 or 2 demonstrations ‘for snow’ that have been held and extensively covered by the mass media e.g. BBC, NPR, ABC, CNN missing that IPCC does not predict end of snow. Rather the contrary. And what would Michael Mann do? Keep mouth shut and believe the end of snow is coming. The alarmists have a forked tongue. No I’m not going to spoon feed you. 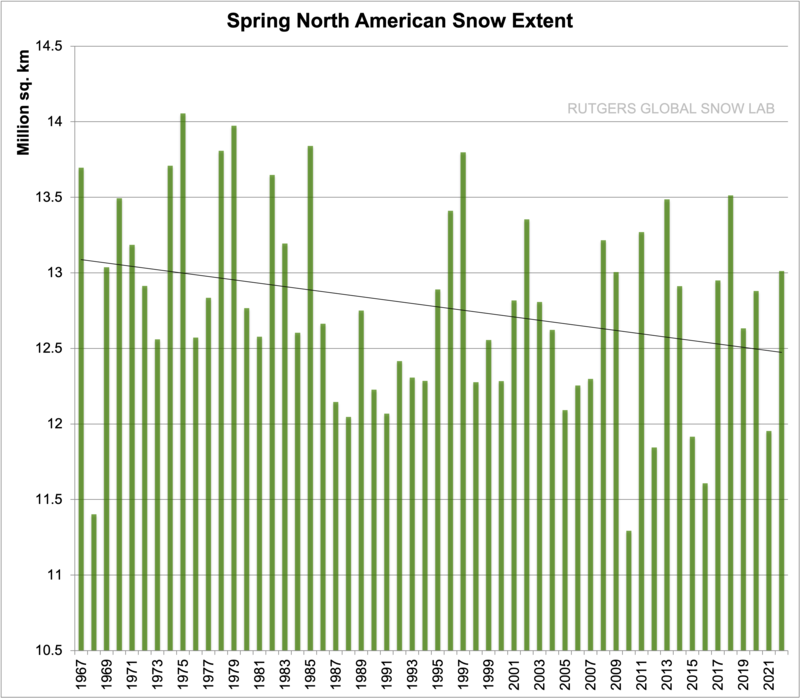 Anyone paying attention knows that in years past alarmists claimed there would be less snow during all seasons and not just the spring. That such predictions resulted in “scientists” claiming that the ski industry would be decimated. And that it didn’t happen and so now the alarmist worry now about spring snow cover. And anyone with common sense can see that despite spring snow extent having declined a bit that since there is little discernable trend over all then the other seasons are making up for any deficits in the spring. They also would know that spring skiing in the US last season was exceptional out west with several resorts being open later in the spring than they ever have. See the difference? That’s why we quote what we are discussing. I do not dispute that alarmists say that snow is going to be less frequent. That’s some actual predictions that have been made by many alarmists (not all), and it is a wrong prediction. What I dispute is that they claim that it is already less frequent than in the past. I haven’t seen such a claim. I have asked for a quote because the article was missing them, you have replied with many quotes that DO NOT claim such a thing. It is that simple. I take it that you didn’t read Anthony’s article that started this thread because it says near the top, “And then of course, there’s Dr. David Viner of CRU, who famously said in a story in the UK Independent titled: Snowfalls are now just a thing of the past:” That included a link to the quote! That should satisfy your request for a quote. who famously said in a story in the UK Independent titled: Snowfalls are now just a thing of the past:” That included a link to the quote! That should satisfy your request for a quote. The quote that you mention says: “within a few years winter snowfall will become “a very rare and exciting event”. Therefore it is a PREDICTION. But thanks for trying. Nylo: Why doesn’t man-made co2 emission warm the planet in November? More AGW in late winter/spring? Did the models show that? We can’t help what you don’t see, willful blindness can be really stubborn. Why does that have anything to do with anything that I said? And why do you thing that it can only snow more if it is colder? You may be surprised if you learnt how very, very little it snows in the very cold Antarctic. It snows so little that it is technically a desert, go figure. What is it that I don’t see? Why don’t you bring the alarmist quotes that I have been asking for, so that I can see them? We are talking here about who says what, not about any climatic implications of the increase of CO2. You are totally misguided. You may need to improve your reading comprehension and overall skills. When is the article about increasing floods and the alarmists’s cats? These days no weather of note can occur without there being a component of “climate change” involved according to the alarmists. In the late 80s when I was at Bad Tolz in Bavaria we would love the kind of snow they’re getting in the German Alps right now and be heading to the Brauneck to enjoy the waist deep powder off-piste. The best winter I did not go without skiing for more than one day during a period starting in October in Austria on a glacier for the SF ski instructor evaluation and ending in early April in Sud Tirol in the area of Vipiteno, Italy attending the Italian SF ski training and subsequent exercise. Now such a thing would be considered abnormal by the alarmists. I was camped out on the Wildflicken training range at one time in 1968, while serving in the Army. I went to sleep and when I woke up there was about two feet of snow surrounding the tent! I got up and stepped outside and looked around at the landscape covered in snow. And I stood there for a few seconds and then I hear this whistle blow and about a dozen camoflaged German Special Forces troops stood up out of the snow, all around the tent, a couple of them within 10 feet of me. And I didn’t see them until they moved! I found out later they were a German Special Forces unit and they were out practicing their skills which happened, on that morning, to be sneaking up on the Americans without them being detected. They were successful! Of course, had we been looking for intruders it might have been different, but all we were doing at that time was sleeping inside a tent out in the middle of nowhere. It was quite a shock to see all those guys just appear out of nowhere like that! There were good! Anyway, I thought German winters were always like that with lots of snow. I sure did like Germany. I hope Merkel hasn’t ruined it. I’m glad I got to see it before she came around. Being tactically proficient can have it’s disadvantages during peace time training. Try hearing tanks and APCs crashing through the trees and brush headed towards you at night and they don’t have a clue your there. It WILL get your undivided attention. That happened to us one winter up at Camp McCoy (now Ft. McCoy) WI. Meanwhile the global warming’s snow armageddon, worst for 30 years, has brought chaos to Central and South East Europe. Looks like the whole of Europe is currently deeply covered in snow that doesn’t exist. ! And the worst cold is yet to come. The “Beast from the East” is coming for much of Europe. We just had half a metre in Chamonix, and still snowing heavily as I left. Next weekend comes the 2nd wave, with a solid week of snow for the UK and French pyrenees. In the north, – Baltic states/SPB Russia it’s quite warm, not much snow, and temps 10C warmer than usual. No ice roads so far and the Baltic sea has almost no ice. And has been decreasing by over half a million sq km per decade during the Spring months for the last 50 years ….. He whines and accuses Willis about cherry picking and then goes on to support extreme cherry picking. Why not show the ‘other’ graphs Rutgers prepared? 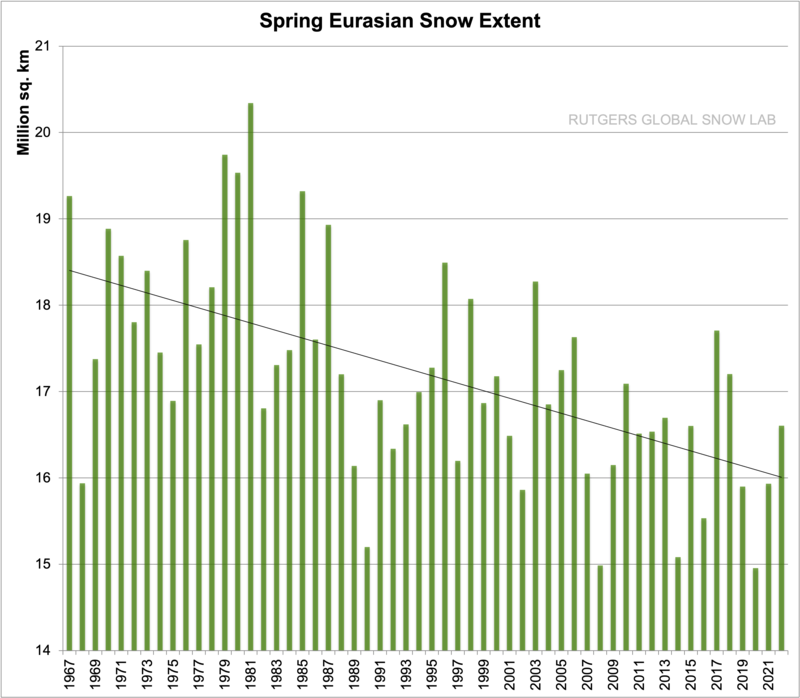 Isn’t it absolutely amazing that CO₂ only negatively changes Spring snowfall extents? 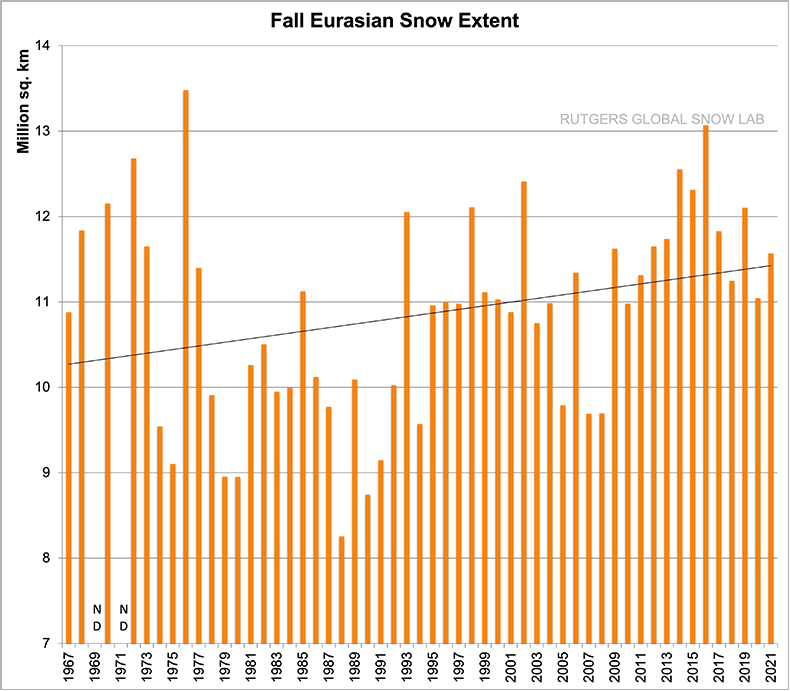 While both Fall and Winter snowfall extents are greatly increased? That one can make such horrid cherry pies from cherry picked graph is always astonishing. Ignored are the possibilities that long term sinusoidal weather patterns are misrepresented by truncated data series. And what were the trends between the 1930’s and 1970’s?? just a reminder that it cycles just like the temperatures and ice. The IPCC deleted the pre 1979 ice amounts after the 1990 Report. Who made these predictions? Not projections, of course…but predictions. As you claimed yesterday, “the IPCC doesnt do PREDICTIONS,” and the IPCC is the body you defer to as the current state of science 99% of the time. So now you’re moving from “predictions” to a “projection.” Just yesterday, you claimed, “A projection is merely a what if. there is no probability of being true assigned to it.” So what are the “what if” conditions associated with that projection and why did you select those specific “what if” conditions? When various alarmist papers predict every possible outcome (more rain, less rain, more snow, less snow, more hurricanes, less hurricanes, etc. ), it’s pretty easy to claim it was predicted. The 15 year running mean shows the trends nicely too. Decreasing from 1975 to 1987, a slight uptick to 1999 and then flat from 1999 to present (the pause). Although it appears during the summer months NH snow cover has generally decreased from 1975 to 2015 and during the winter months it is generally increasing. Plot is NH snow cover per season. Thick green line is 10 year running average. Signal-to-noise ratio is fundamental to good science, and any analysis should start with a macroscopic evaluation. If the error bars on the raw data are larger than the apparent trend, then there is no point in applying advanced mathematics to tease out tiny trends to multiple decimal places. The proper scientific conclusion is that no conclusion can be made. Climate alarmists make their living violating this principle. If only… Mortgage payments and dreams of peer-praise and public fame necessitate that results be prioritized over an accurate portrayal of reality. Slaves don’t make good scientists. It takes balls to have faith to actually do real science. Warming increases evaporation and precipitation. There actually should be more snow if it is warming. This is countered by a shorter snow season, but during the season there should be more snow. This is born out when you look at the Rutgers plots for fall, winter and spring. There’s more snow in the fall and winter, and less in the spring. The less in the spring is probably due to melting sooner. This truck driver figures it’s weather as usual. what null did you think I was testing? there is nothing scared about .99 or .90, or whatever. merely reporting the p values because NOT EVERY ANALYSIS is a test against a null. That would be the most transparent way to do it, like there s a 81% chance the trend is greater than zero. That gives you more information that merely saying “not statistically” significant. I agree, I think there *will* be a wall once the dust settles. not a deflection at all. just a consistent philosophy i apply about p values to everything. I thought I’d add to this thread. I am an electrical engineer, and use statistics often in my work. I am not a statistician, but this is what I do know. First off; P-value is the measure of the 95% confidence interval of the data set vs the fitted line. A P-value of 0.05 indicates 95% of the data points do not fit the predicted line. It does not say whether or not there is a trend in the data. It only indicates whether or not the trend you’ve developed is statistically significant or not. A low P-value means you have to question whether or not your trended line has any statistical significance. Second; A better measure of the fit of the trended line to the data is the R^2 value. The trended line developed by your software is the “least means squared” fit of the data. The R^2 reported above is about 4%. This means the fitted line is showing next to no fit to the data. An R^2 of 70 or 80% would be a whole lot more believable. Lastly, the standard residual error is positive, indicating the sum of all the residual errors of each data point is greater than the fitted line. Essentially more data points are above the fitted line than below. A zero number here would indicate the mean of the fit matches the mean of the data. Your standard residual error on about 0.75 on the graphed y-axis mean of about 25 million sq kilometers is about means the data set mean is about 3% higher than the fitted line mean. Again, insignificant. In short, I would never use the data set above to drive any type of decision in any statistical sense. The amount of signal is just not great enough to discern from the noise. “The R^2 reported above is about 4%.” The interpretation of that is about 4% of the variance in the dependent variable can be predicted or explained by the independent variable. In other words, useless! ‘statistics is no more than a numerical origami’. Rich, you should know that is like telling a 4 year old to desire broccoli over fruit snacks. I’m just glad he is back to making long comments defending the faith because I never got to read the full Moshe, just the recent snarky drive-by’s. Is the cat saying “If I knew the University of East Anglia was going to spend £100,000 hiring a PR firm to spin Climategate I would have demanded my student course fees back”. I’d be interested in a link to that info. “The University of East Anglia (UEA) found itself in just such a PR “hole” in November 2009 when thousands of private emails exchanged between climate scientists were dumped online in an incident that became known as “Climategate”. In the following months, the university and its scientists became the focus of an international maelstrom with all sorts of wild accusations and claims were being made against them, particularly online. It was exactly the sort of situation that required expert and sustained handling by PR professionals. In the days and weeks after the email release, the university’s in-house press department was criticised for not reacting harder and faster to the storm enveloping them. The accusation was that they were actually making the situation far worse by largely refusing to comment, or, more importantly, putting any of the scientists up for interview so that they could defend themselves against any accusations by contextualising and explaining their emails which were being cherry-picked for damning isolated quotes. But something changed in February 2010. Suddenly, key scientists were now being offered up for interview. The “fight back” had begun, just as a wave of enquiries into the affair were getting under way. It has since transpired that UEA had at this point finally decided to hire the services of an external PR consultancy called the Outside Organisation, the managing director of which, Neil Wallis, has since been arrested and bailed without charge as part of the on-going police investigation into phone hacking due to his former role as deputy editor of the News of the World. Rather a lot of money to throw about instead of dealing with the issue properly. You should provide the p-values for those plots also. Why will images not show in the text anymore? English Lit doesn’t deal in p-values. The time series is not important. What is important is Mauna Loa January CO2 versus Rutgers Jan N. Hem. snow cover in millions of sq km. That is about the time of year of snow maxima. The graphs has a correlation coefficient trend of 0.0009, which is just random noise. There is no CO2 to snow cover correlation for the Northern Hemisphere. Good shot, Donald! That’s a silver bullet right to the heart of the issue. You neglect the fact that warmer means wetter. Warmer means wetter when it’s not causing drought. Warmer means wetter when it’s not causing wildfires. And warmer means wetter only in AGW theory! Observations across the world show that the rate of pan evaporation has been steadily decreasing over the past 50 years. * This is known as the pan evaporation paradox. *Fu, Guobin & Charles, Stephen & Yu, Jingjie. (2009). A critical overview of pan evaporation trends over the last 50 years. Climatic Change. 97. 193-214. 10.1007/s10584-009-9579-1. **Liu, Xiaomang & Zheng, Hongxing & Zhang, Minghua & Liu, Changming. (2011). Identification of dominant climate factor for pan evaporation trend in the Tibetan Plateau. Journal of Geographical Sciences. 21. 594-608. 10.1007/s11442-011-0866-1. I wouldn’t expect there would be. As a non-condensing GHG increase will cause an increase in the one condensing GHG (H2O/WV) also. And therefore give more precipitable water/snow. IOW there is an +ve correlation there (more CO2 more snow) until the (more CO2 less snow) -ve correlation takes effect other than in Spring/summer. Warmer temperatures would change the snow/rain line in the winter. There is always a “precipitation phase transition” line in any winter storm. A consistent warming offset, would move the line further to the North in the Northern Hemisphere, and reduce the volume Lake effect snows, since the air temperature would be closer to the exposed water temperature. So you would expect to see a reduction in the coverage of snow, and the duration of the coverage of snow, if temperatures were increasing during the winter months. There is an effect that near zero, becomes significant in the precipitation of snow rather than rain. Greater intensity brings the freezing level closer to the surface (~ 3000ft) in light winds (little mixing). So the phase transition line moves towards the warming side as intensity increases – which is the case with a higher humidity content. This is a familiar effect in the UK. Been there many times as an on-the-bench forecaster. Intensity is driven more by the pressure gradient, which is driven by the temperature gradient, which should be less in a “warming world” that warms more in the Arctic, than the lower latitudes. So intensity should be less. Which means similar storms will transition to rain further North, than in a colder climate. There is no logical way you can square this circle. If the winter is warmer, it would reduce the snow extent and snow volume, because more of the “available precipitation” will fall as rain, instead of snow. > There is no logical way you can square this circle. If the winter is warmer, it would reduce the snow extent and snow volume, because more of the “available precipitation” will fall as rain, instead of snow. What about a cold desert that previously didn’t get much snow because it was just too dry? With increased precipitation, it is still cold, but it is less of a desert and receives more snow. It is a desert because it does not get much precipitation. Last I checked snow is precipitation. If you are thinking a place that on average gets less than 8 inches of precipitation a year, and possibly increases by a few percentage points, is going to change the average for the WHOLE NORTHERN HEMISPHERE you need to go back to your school and ask for a refund! Either way if the temperature is higher you will get less snow, and it will melt faster. Both of those contribute to less snow EXTENT. The snow that sticks around falls under cold conditions, and has cold temperatures behind it. Warming will decrease snow extent, everywhere except places that are so cold they have to warm up to snow. And they are in the center of the snow extent in the winter, not on the fringes. > is going to change the average for the WHOLE NORTHERN HEMISPHERE you need to go back to your school and ask for a refund! There are many deserts in the northern hemisphere. 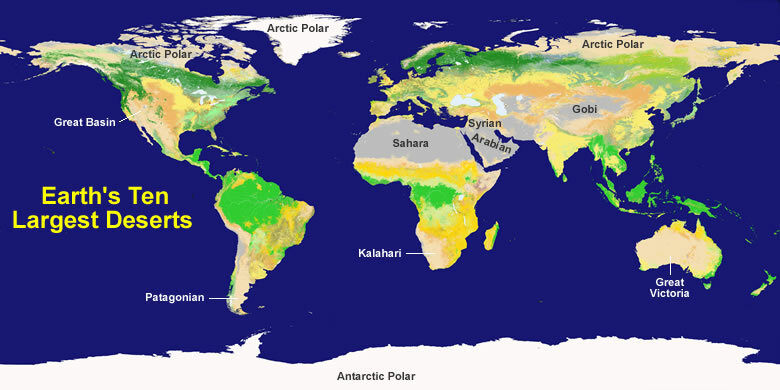 Many of those deserts are cold enough to snow in the winter, especially the polar deserts. The Great Basin is quite cold as well. It is even possible to snow in the Sahara desert. Precipitation for those deserts will change snow extent. Places that didn’t get a lot of snow before, or even any snow before like the Sahara, can get snow. I am well aware of those deserts and the climate, having lived many years in them. And they are dry for a reason. And the snow melts quickly for a reason. And you are laboring under a false impression if you think warming is going to make them more snow covered in the winter, or any other season. Increased snow extent means snow covered, over time. That implies that the snow happens, and it persists. The deserts are dry. When the snow comes it only takes a little sun, which happens most days, to melt the snow. The defining attribute of deserts is minimal cloud cover. And while some deserts are far enough North to get some snow, most of them occur further south in the sub-tropical region of the descending air from the Tropical Hadley cell. Which in the USA means closer to Arizona, than Montana. So changes in desert snowfall is insignificant compared to snowfall in the 35*- 55* N Latitude band, in areas that normally receive ample precipitation year round, and how long it persists. North of that band is snow covered most of the winter, and South of it is rarely covered in snow in the winter, except at high elevations. > When the snow comes it only takes a little sun, which happens most days, to melt the snow. Snow is unlikely to melt in the polar deserts of the arctic in the winter. Nuuk, Greenland has an average high of -5°C in January, for example. I believe I am done here. First you said warming must reduce snow extent, now you are saying precipitation is insignificant, but non-zero. So we agree now, precipitation alone can have an effect on snow extent. I don’t want to argue ad infinitum about how much that is, but it is some. I believe it is actually significant and what you are seeing with increased snow extents for fall and winter in the northern hemisphere. But it will take too much effort to convince you of this, so have a good day. That is because you don’t understand the difference between Arctic deserts and Sub-Tropical deserts. Or you just like to “muddy the water” when you are obviously wrong, and are unwilling to admit that. Arctic Deserts are normally snow covered in the winter. It is cold and dark, and most snow that falls stays for many weeks or until winter is over. The snow is dry so it will get blown around, but it rarely gets warm enough to melt. Lows in Fairbanks, AK were -46, yesterday. Today it will get up to -5. Not much melting going on. Back in 2009 Swiss minister of transport, environment and communication (yep, both 3 positions in 1) Moritz Leuenberger and a cohort of delegates plus a bunch of “scared” kids went to cop15 on a special train. Media was full of above mentioned kids asking (crying…) Santa to bring them snow and more snow while (very) concerned adults reassured them that they are actively working on it. Much less coverage at the airport when the cohort embarked back home on a chartered twinjet ride. A few years later, after endlessly spending public money in railway structures to save the earth, Moritz became the chairman of Implenia, the biggest railroad/tunnel building and maintenance company. Today Swiss Railways are vastly funded by fuel taxes since the company, despite legendary high ticket prices was historically never able to show profits or break even. That’s how green economy works, fears for money. The address could have been entered incorrectly, or the page could have gone missing. Please click here for the homepage or click the search icon on the top right hand corner of the page. The News weasels and the so called scientists cannot handle the truth. So they bury it. It’s hardly buried there are loads of links to it online, if you want to read the exact article you can find it here. Note that if you read it you’ll find that the article was focussed on ‘lowland Britain’ and more specifically the ‘South-east’. It quoted the decline in snow cover since 1970 and showed that snow fell only on average 0.7 days since 1988 and that the last substantial snowfall was in Feb 1991. It was in that context that Viner said “children aren’t going to know what snow is”, well kids in London wouldn’t have seen a significant snowfall for 9 years. He also said that heavy snow will return occasionally but when it does we will be unprepared “Snow will probably cause chaos in 20 years time”. It did in 2009 with the heaviest snow since the aforementioned 1991 and again in Feb 2018. Exactly as Viner said it would in that interview, of course no-one ever mentions that. Everybody who goes after Viner completely omits the context and leaves the impression that he was referring to the world in general. He said heavy snow was becoming less frequent in the South-east of England and that as a result on the rare occasions when it occurred it would cause chaos, and he was exactly right! For example a town that hasn’t had snow for 18 years doesn’t invest in snow ploughs or salt, then even a few inches cripples them. It’s Viner’s critics who ‘cannot handle the truth’, they never have. Try doing what was done the Viner in the discussion of one of Willis’s posts, I don’t think you’d enjoy his response. Just for some further context here is “Londoners brave the snow in Piccadilly Circus” in the Feb 2018 snowstorm that crippled London. He might as well have quoted Viner! Not really. In the 3rd paragraph, it mentioned “lowland Britain” (well, “much of” it) as being “free of significant snowfall” for “the first two months of 2000.” It mentioned that “December brought only moderate snowfall in the South-east.” It shortly thereafter references the past 15 years “in the south of England, for instance” (which seems to be an area larger than the “South-east”). The first sentence references “Britain” generally. The second paragraph references “Britain” generally. The paragraph before Viner’s quite refers to “average temperatures in Britain.” Right after Viner’s quite, it notes that “the effects of a snow-free winter in Britain are already becoming apparent.” Again…Britain, not just the South East portion (although it mentions a lack of sleds at a toy store in London). The next paragraphs refer to East Anglia, Peterborough, Cambridgeshire…much of that can be argued to be “lowlands,” but it’s not in the South East. Even if you want to lump that in, what follows is a quote from a professor in the Netherlands, another scientist (David Parker at Hadley) referring to “British children” (not just those of the South East, or the lowlands) ultimately could only have virtual experiences of snow. The context of the article immediately before and after his quote is Britain in general. The article makes numerous references to Britain in general along with specific locations that are outside South East England. Bavaria, get ready for the snow! AMO and PDO don’t seem to match, hmm??? Also checked NAO and PNA. The snow cover in the US today will increase. Coming from the American midwest and the stereotype of “midwesterners have never seen the world so I’m apparently too stupid to make remarks”, I can say that anecdotal observation suggests a “slight” uptick in snow fall but snow tends to fall later in the winter season. Maybe Minnesota and North Dakota still get white Christmases but really anything further south has a drab brown and gray Christmas. Ironically, Missouri, Kansas, and Iowa are getting pounded by snow as I write this. Oops, forgot to close the em tag properly. How long did the snow stay on the ground – after it landed? I’d venture The Climate would be different if (say) 6 inches of snow fell then melted inside 3 hours – than if 6 inches fell and remained for the next 3 months. You do know EVERYTHING after all. What’s the answer? Heavy snowfall approaches the northern Alps. Another major snowstorm is ahead for the northern Alps, especially across northern and western Austria, southern Germany and east-central Switzerland. With already an extreme amount of snow in many regions (locally 300-500 cm based on the latest reports), an additional 100-120 cm (locally even more) of fresh snow is expected through Tuesday morning, Jan 15th. Life-threatening situation with major snow avalanche threat will worsen once the snowfall intensifies this weekend. Perhaps I should repeat my warning and salutary lesson about scientists blithely pontificating that snow would be a ‘thing of the past’. After that headline news from Dr David Viner, a respected scientist, in a respected newspaper, what airport manager is going to invest in the $30 million of new snow-clearing equipment that the airport desperately needs? Any manager ‘wasting’ so much money on non-existsnt snow would be pilloried in the press, and lose their job in an instant. Try explaining that employment gaffe to the wife and kids. The result was that no equipment was purchased. And the long-term result was that ten years later Heathrow was paralysed by snow and closed for three full days, causing hundred(s) of million(s) dollars or more in airport and airline losses. The only people laughing were the local hotels, who I am sure paid Dr David Viner to make his stupid assertion about no snow. And this was not an isolated incident. Local councils up and down the country also failed to invest in new snow clearing equipment, and so our road and rail networks all ground to a halt. An entire nation paralysed by one deranged scientist….! Think about it – lSlS could not have done more damage to the UK economy if they tried. So who is paying Dr Viner and the CRU? And did the CRU ever repay UK plc for the damage they caused? No, they just went on to make even more absurd and unsubstantiated assertions about dire climate change. What happened was exactly what Viner predicted, that because snow in the South-east of england was becoming so infrequent the occasional snowstorm in the future would cause chaos! However, no significant snow for 18 years and then a relatively minor snow fall caused chaos exactly as Viner predicted. By the way Viner didn’t write the article or come up with the headline, he was just interviewed to comment on the reduced frequency of snow fall in the South-east and London and was very much on the mark. Why don’t you ever criticize the author of the article, do you even know who it was? I would venture to suggest that no authority would maintain snow ploughs and salt supplies for 18 years between snowfalls, the tax payers would be moaning like crazy, so you keep the bills low for 18 years and put up with complaints when the storm does hit. Thanks for doing that. That is the fairest way to show the data. A zero-based graph is honest and doesn’t magnify trends. It’s also good to include all the seasons like you did. This is consistent with more warming, which would cause increases in some seasons from increased precipitation, but also less in other seasons due to increased melt. Yes. We have established with absolute certainty that whatever happens it is “consistent with more warming”. Accept for the unexpected discovery two decades ago of decreases in measured pan evaporation, known as the ‘pan evaporation paradox. There is lots of discussion about this and it seems the best answer is that there is negative feedback between potential and actual evapotranspiration. *Hobbins, Mike & Ramirez, Jorge & Brown, Thomas. (2004). Trends in pan evaporation and actual evapotranspiration across the conterminous U.S.: Paradoxical or complementary?. Geophysical Research Letters. 31. 10.1029/2004GL019846. I don’t quite understand this paradox. HadCRUH says humidity is increasing at 0.08 g/kg per decade. The humidity is coming from somewhere. So, perhaps the pan evaporation paradox is a regional thing, and the loss in some regions is made up by gains in others? Some of the annual variations are five to six times the “trend” on that graph (1973-74,1976-77,1997-98). Even without error bars, eyeballing it suggest that it is flat both statistically and otherwise. And if anything it is slightly less humid than it was at the start to the chart in 1973! I’m inclined to trust the pan observations because they are global and the negative trend is large and very long – now in decline for almost 60yrs. The humidity in the atmosphere has gone up. This is indicated by almost every single type of measurement done, including satellites which would have excellent coverage of the entire Earth. This paper lists several measurements all over the world using different instruments, and they all agree that humidity has increased. The pan evaporation paradox is only a measurement problem. It doesn’t imply the humidity isn’t there. It’s just that they had trouble accounting for it by measuring evaporation. In 1998, it was claimed the paradox was solved (link from Wikipedia article on pan evaporation). The reasoning makes sense to me. In any case, pan evaporation is a moot point. The humidity has increased. It will affect precipitation, including snowfall. And apparently it does, because we see greater extents in the fall and winter. Unless you can come up with a better alternate explanation, I’m sticking with increased precipitation from warming. It shouldn’t make sense to you! Because the pan records are not moving, they are are continuous long-term records of the places they are in i.e “dry desert” and “rain forest.” Unlike Argo buoys, they don’t float with the currents! There have been no long-term changes in dewpoint temperatures or specific humidity but rather there has been a decreasing (1947–79) and then an increasing (1980–2010) trend in both variables. Your paper was only for the US. And it makes perfect sense, because the US temperatures have been relatively flat compared to the rest of the world. Try again, this time with global numbers. The size of the trend is”quite small” globally and less for Australia where both issues are still up for debate. “The true trend value remains uncertain; the confidence intervals are quite large. …As suggested earlier, the final value of this small trend is highly dependent on the start and end times chosen. Willett et al., 2007* showed negative trends for much of Australia; however, this was likely because of the choice of the starting time of the trend. *Willet, K. M. 2007: Creation and analysis of HADCRUH: A new global surface humidity data set. Ph D. thesis, 198 pp. Thanks a lot Willis, this adds support to a discussion that I had above. I personally think a running average of the seasonal NH snow cover shows more detail and fluctuations than the linear trends. Green lines on plot are 10 year centered running average and show a potential 9-year quai-oscillation. Just my cyclomanic opinion. Your winter and fall (red and purple) time series shows 7-8 year quasi-oscillations quite well prior to about 1998. Here is a link to the plot of the periodicity and wavelet analysis that also shows this prominent oscillation in the NH snow cover data. I got into this with Mosh on Twitter. I said that there was a slight negative trend since start of data, and a slight positive trend over the last 30 years. Mosh accused me of cherry picking…..
Has anyone done a monthly or weekly assessment of the data. To me it looks like autumn is finishing earlier and summer is beginning earlier. If the the decline in Spring cover is due to melting in the last week or month then should I be worried? If the numer of weeks above 60% of a erage maximum remain fairly constant should I be concerned? It is indicative of the direction of travel. As this place demonstrates daily … ya takes yer money and takes yer choice. I pulled up the archives for the article in question. I strongly urge to save off site. Scroll down to see pictures people have posted on social media.